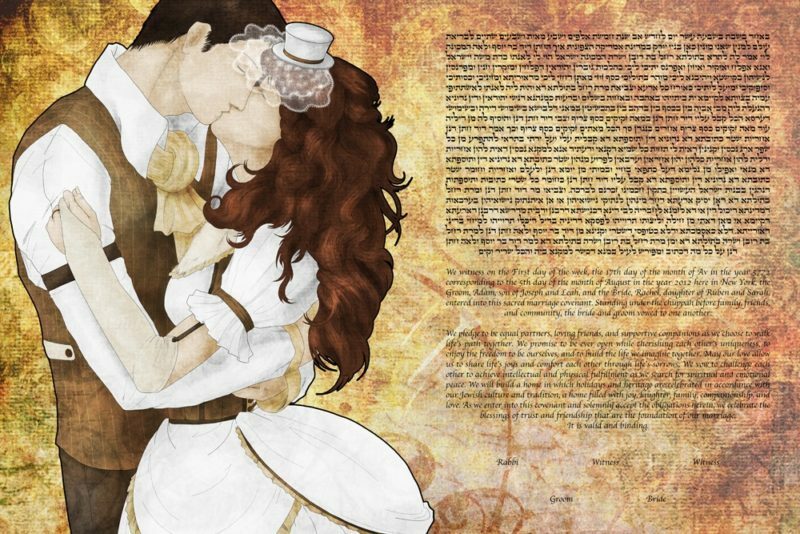 We know what you may be thinking as you’re reading the title, Vintage ketubah? 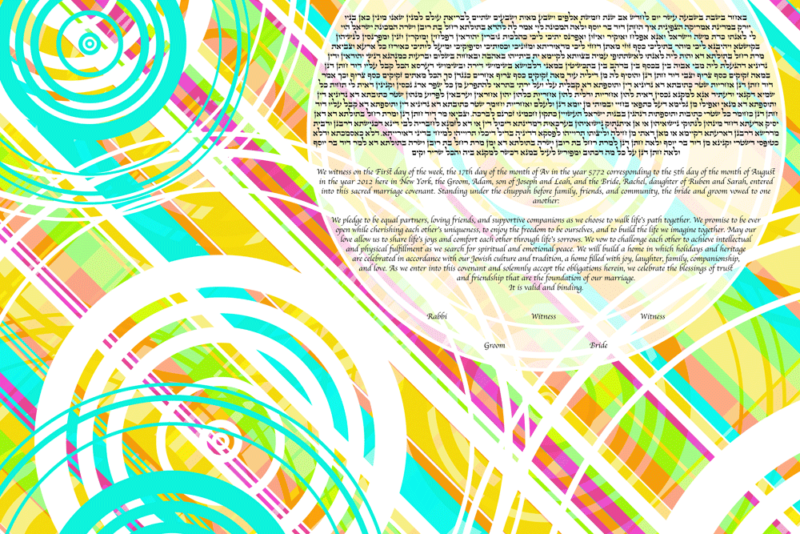 Isn’t this website all about a modern take on ketubah designs? Well, as paradoxical as it may sound, vintage might just be the new modern, since it has made its presence very clear in different spheres of modern life – including art. We are witnessing the comeback of vintage, and it seems that it is here to stay. There are just some strings with the past that should never be broken, and vintage style is the best proof of that theory. If you’re all about that vintage life – you’ll absolutely adore our vintage ketubah collection! How often can you hear the word vintage nowadays? It has returned with a bang when it comes to fashion, interior, music, and many other spheres. In fashion, vintage style is worshiped and absolutely a must. No matter how many innovations are thrown our way, vintage seems to bounce back from it and take over the market. The strong presence of vintage can also be felt in different aspects of architecture and interior design, as more and more people are gravitating towards vintage style as opposed to the minimalistic modern approach. Call it melancholy or sentimentalism, but one thing is clear: great styles from the past will never go out of style, so it’s no wonder many people choose to go down the memory lane. What’s particularly interesting to see is a blend of modern art and vintage elements, which has become very common. Just because vintage is greatly appreciated doesn’t mean that modern should be underappreciated. It is always fascinating getting to have the best of both worlds, and even creating our own style by combining certain aspects of vintage with other alternatives. The same rule applies to ketubah design, which is something we’ve made very clear in this company: you should be the designer of your ketubah, and the possibilities are unlimited! 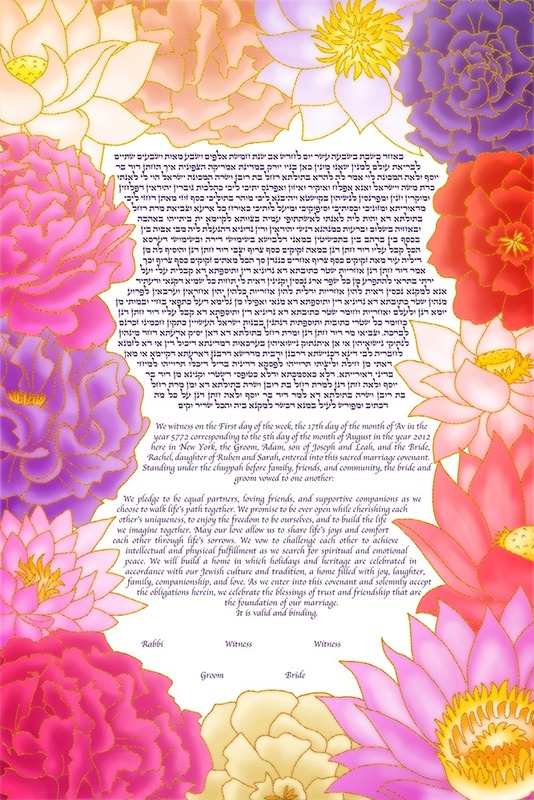 The Persian ketubah is one of our many vintage ketubah designs, celebrating and cherishing tradition. Just like all the other vintage ketubah pieces, this one has an interesting background story and a strong message. 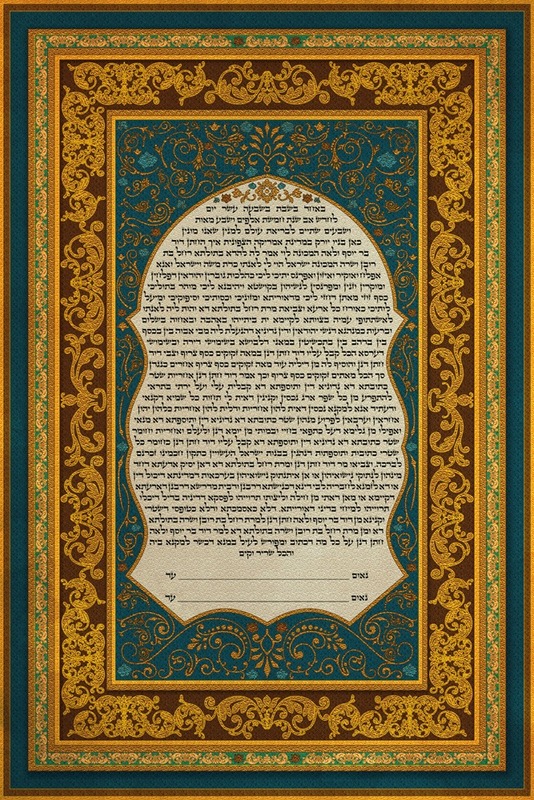 This ketubah design is inspired by the unique, unreplicated style of the Persian Jewish community, incorporating bold, rich colors and golden, luxurious patterns in this gorgeous vintage design. It stands for the unity of the Jewish culture and the Persian heritage, which have been interconnected for thousands of years. That magical moment right before the evening takes over the day when the darkness carefully glazes over the darkness, creating a rhapsody of colors all over the sky – the dusk of the day. Although often confused with flaming sunsets, dusk actually represents a very special moment right after the sun has set – but not completely. It occurs just before the sun has left the sky completely, introducing nighttime, and dusk may just be the most mesmerizing instance captured in the sky. The transition between the fire-red sunsets and the blue, dark night sky marries into a fascinating mixture of colors, making dusk captivating. What the dusk also represents is a gate between two worlds. It is a very significant moment on the verge of the day, and the very beginning of the night. Dusk represents a moment of tranquility, peacefulness, and serenity – just a perfect time to gather your thoughts, disconnect from the outside world and take in the beauty of the present moment. Dusk occurs once the noise and the chatter of a busy day cease, and the night is about to take over and conclude the day. The dusk of the day captures the very last rays of the sun and turns them into an enchanting, vibrant outburst of colors splattered all over the sky. It is the dusk of the day when you look up to the sky and think, There is no greater artist than nature! It is in this time of the year, spring, that dusks tend to be more captivating than ever. The sunshine makes its anticipated return, days are longer, and we have to wait for the dusk longer – but it is always worth the wait. After gloomy, grey, cold winter days, dusks are once again vivid and filled with colors, symbolizing a fresh start. 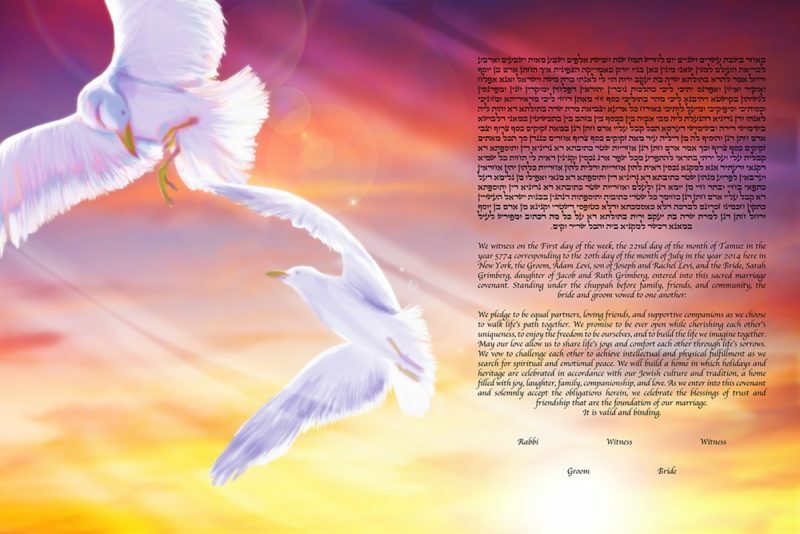 The Flying into the Dusk ketubah portrays dusk in all its glory, combining it with another symbolic image – two white birds flying together. The two birds flying into the dusk together represent love, unity, as well as freedom which is shared and enjoyed in their unity. Birds also stand as prominent symbols of hope and life, just like the dusk, which is precisely the kind of energy you want your ketubah to radiate. Interested in more dusk-inspired ketubah designs? Discover our dusk ketubah collection gallery for more unique ketubah designs combining the boldness of modern art and the vibrancy of a spring dusk! As we’re approaching the end of winter, leaving the cold, eventful holiday season behind, we’re welcoming spring – the time when everything seems to come alive, shaking off the snow and frost, and embracing the very first sun rays. Days are longer, nights are shorter, and spring seems to be just the perfect opening for what’s next – summer, quite possibly the most anticipated season of them all. Now, let’s not allow summer to take the spotlight just yet when spring has so much to offer. Let’s enjoy spring, as brief as it may be, and take in every single blossoming flower and the magic of nature’s awakening. Spring truly does bring a breath of fresh air along with it. After long, cold, grueling winter months when everything seems to cease and disappear, spring announces the return of the sun, which triggers an awakening in nature. The skies are blue, the days are warmer, the air is no longer crisp, and the leaves turn green, just as everything else around us. A dreamy, passive, dull winter atmosphere all of a sudden gets reversed, and spring introduces brand new energy, which does not only symbolize renewal in nature but in human lives, as well. Spring cleaning isn’t just a phrase, and there is a reason why people find spring to be the best time for new beginnings. Yes, we all start our resolutions list at the very beginning of the year, but during winter we’re usually still unmotivated for changes. With new spring energy, we are inspired to revamp our closets – and our lives! Spring cleaning is so much more than rearranging your living space and throwing away those jeans you’re never going to wear – it represents a process of clearing our minds and souls, as well. Spring is a symbol of renewal, rebirth, and starting anew, which makes it a perfect time for new projects, adventures, loves, friendships, and everything else that truly makes us happy. Did you have a spring wedding, or was it spring when you first kissed? Regardless of what spring represents in your relationship, you’ll love our spring ketubah collection. 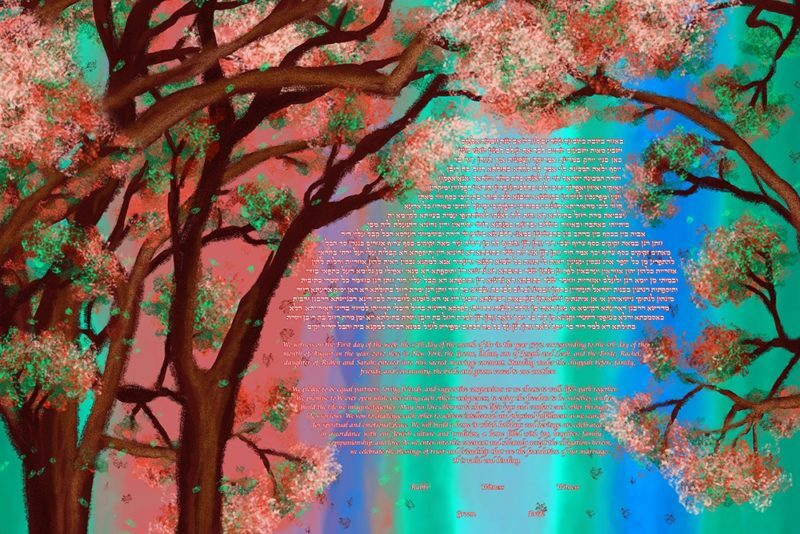 In Love With Spring is a perfect representative of this colorful collection, which portrays nature coming to life through a blossomed tree. The combination of pastel colors and bold pinks and blues brings together the two main aspects of our ketubah designs: the romantic and sensual side on one hand, and modern art on the other. When the topic of Miami comes up, what is the first thing that comes to mind? For some, Miami is the epitome of nightlife, world-famous night clubs and beach bars where the party never stops. For others, Miami represents a perfect holiday destination with mesmerizing beaches and beautiful sights. Another reason behind Miami’s growing popularity around the globe is its cultural and historical heritage, as well as the artistic aspect. What is it that draws you back to Miami? Is it the fact that Miami is always the life of the party or its romantic, gentle side that may often be overshadowed by its urbanity? Whatever it is about Miami that has your heart captured, you’ll absolutely love our Miami inspired ketubah collection. Miami is so popular that you may think there’s nothing about it that could surprise you. In fact, there are some intriguing facts about this glorious city that even the locals may not know about their hometown of Miami. First and foremost, have you ever wondered how Miami got its name? A native tribe, known as the Mayaimi, are the ancestors of Miami, hence its name. Speaking of Miami’s history, women will be thrilled to learn that a woman called Julia Tuttle is responsible for Miami officially becoming a city back in 1896, when she negotiated with a railroad mogul to come to Miami. When it comes to Miami as a famous tourist destination, it has been an oasis for many people, including many famous names. Besides actors, TV stars, and athletes, there have been visitors the presence of whom did not make the locals too happy, one of them being the infamous Al Capone. No wonder many wished to call Miami their home, considering the fact that it offers pretty much everything you could wish for, from the unmatched club scene of the South Beach and inspiring Art Deco district, to white-sand beaches, mesmerizing underwater wreck sites for divers, and warm winters. The Miami Skyline ketubah design captures and vividly portrays every single aspect of Miami and marries it into one work of modern art. As complex and diverse as Miami is, this ketubah design represents its multilayered nature, including both its urban and romantic side. 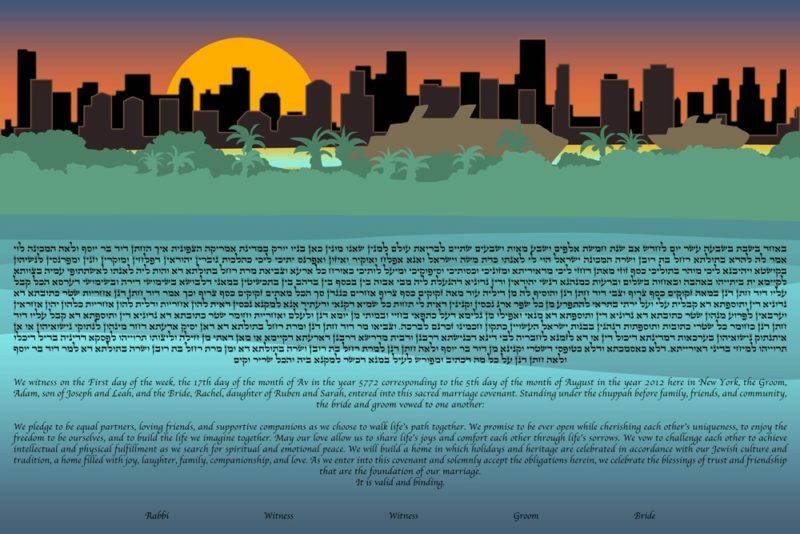 The Miami Skyline ketubah incorporates the city skyline symbolizing its busyness, palm trees and the ocean standing for its natural beauty, as well as a gorgeous sunset, emphasizing the romance this city has to offer. No matter what you do in life, it is always about that special connection: the way you connect with your emotions, your work, your environment, and especially people. The connection we build or fail to achieve with certain people seems to be one of the most complex matters in life – and the most important. Not everyone can click, and you won’t be able to feel that unique connection with every person you meet. And while that may sound scary, it is also kind of relieving – knowing that we aren’t meant for everyone and that the right kind of connection will happen only with the people who are truly meant to be in our lives. One of the most special connections we can establish in our lives is with our friends. They say that friends are the family we choose, and it takes a very strong connection for someone to be considered family when they’re not indeed related. The foundation of a friendly connection incorporates unlimited trust, loyalty, love, and above everything else – respect. One can have many acquaintances and meet many people, but only a few can be considered true friends and acquired family, which is a connection that never fades. A connection that is often considered the strongest is love between two people who have both felt that spark. They say that we’re all bound to find our soulmate, and when we do, it is an instant, undeniable connection that everyone will notice. This strong, beautiful connection is the essence of life and the true meaning of happiness. Our connection inspired ketubah collection portrays the connection between two people which escalates into a loving union, symbolized by a ketubah. One of our connection ketubah designs could be the testimony of the connection you and your loved one feel and celebrate. 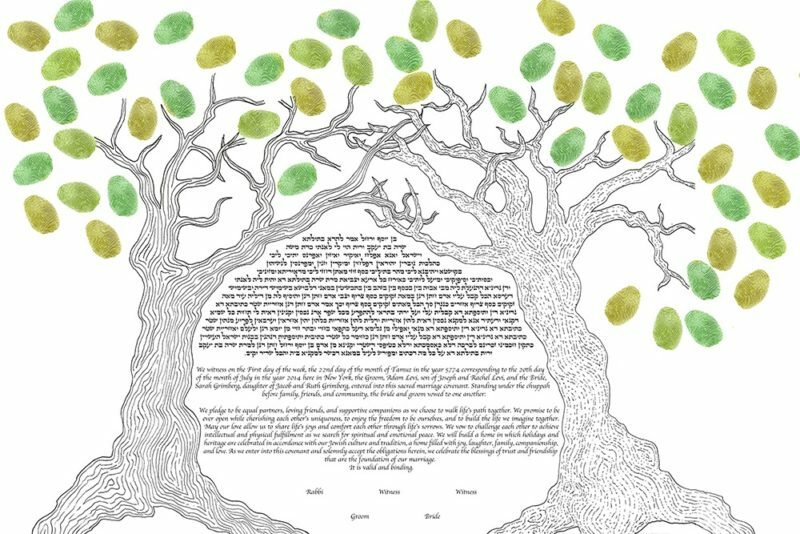 The Love Entwined ketubah design represents unity and connection by portraying two trees intertwining. 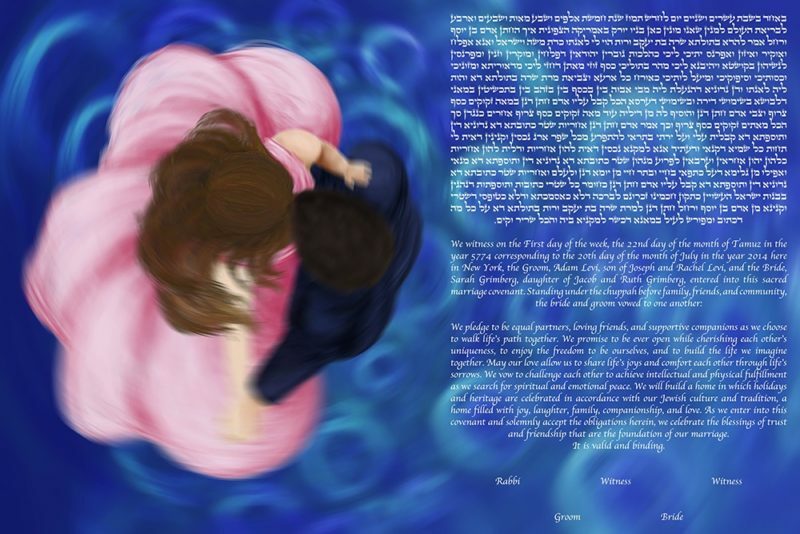 This connection inspired ketubah represents merging of two lives, which have forever been joined in marriage. It also emphasizes and celebrates the fact that the two trees, representing each of the union members, are still individuals, as their branches are meeting and combining – symbolizing their connection. 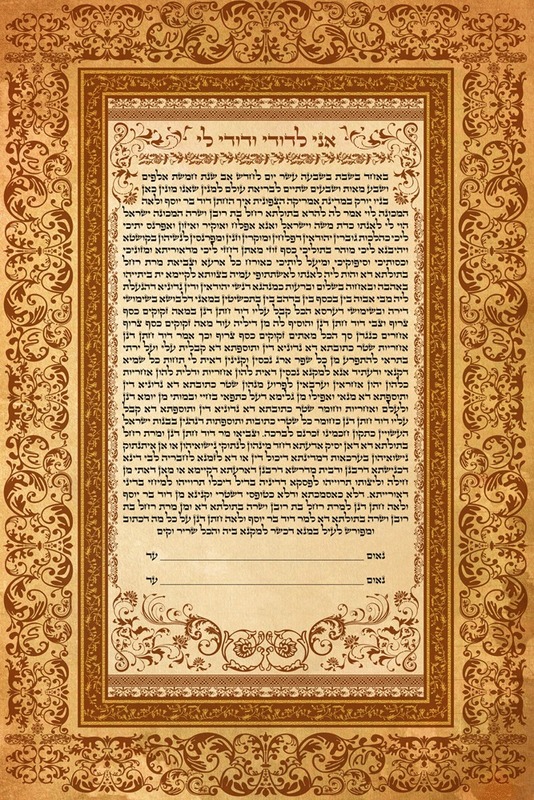 What’s special about this particular connection ketubah design is that it also combines your Ketubah and the Signing Board. Your guests will get to leave their own mark on your custom ketubah by imprinting their fingerprints! This way your ketubah will not only symbolize the connection you have with your spouse, but it will also eternalize the friendships and family relations. They say that once you’ve been to Italy, there’s no way you’re not coming back for more. Italy is truly a magnetic, captivating country with more sights, wonders, and beautiful destinations than we could name. Located in the south-central part of Europe, this boot-shaped country is one of the most famous tourist destinations, counting thousands of visits every single year. No wonder people are absolutely head over heels for Italy! What’s there not to love about good food, fine wine, beautiful people, and breathtaking sights anyway? Italy is well-known for its exquisite cuisine, including popular dishes such as pizza, lasagna, gelato, and of course – pasta. Italian dishes are loved and made all over the world, although they say you haven’t had pizza until you’ve tried it in Italy. There’s a reason for food lovers to consider Italy for next vacation! While Paris may be the ultimate city of love, Venice is most certainly a close runner-up. Venice is most known for its Grand Canal, 3,8 km long, where people enjoy romantic Gondola rides. When it comes to the incredible popularity of this destination in Italy, the numbers speak for themselves: roughly 15 million people visit Venice every year, and it is certainly not a rare sight seeing a proposal happening in a Gondola. Italy is also a country of great artists, including Leonardo da Vinci, Bernini, Michelangelo, and Raphael, as well as many other world-famous sculptors, painters, and architects. It is precisely art and architecture that draws so many people to Italy, where some of the world’s finest art pieces and architectural wonders are located. Only in Italy can you see the cathedral of Santa Maria Del Fiore, as well as the most famous painting in the history of art – Mona Lisa, by Leonardo da Vinci. Wine lovers will find their oasis in Tuscany and its famous vineyards, where some of the finest wines in the world are manufactured. A fascinating fact about Italy and wine is that Italy is the leading manufacturer of wine in the entire world. Italy is not only a country of food, art, and wine. Milan is known as the capital of fashion, and its Fashion Week brings the biggest names of the fashion industry to Italy every single year. The Modena ketubah design is inspired by the Jews of Italy – Modena in particular, and their ketubah, which combined elegance and the turbulent traditional Jewish life. With the overflow of new styles, trends, and movements, in the midst of the urban chaos and the sea of innovations, somehow, retro has found its way back. Its comeback wasn’t all that sudden, however. Over the years, we have witnessed different retro waves returning, one by one, and surprisingly gaining the sympathies of millennials who weren’t even around when these styles were at their prime. It may seem counterintuitive, but the bigger modern revolutions we experience, the more we seem to be melancholic about everything retro. What is it about the retro and past times that draws us back in and makes us embark on a trip down the memory lane? Retro is simply a testimony of great times and a way to relive or be a part of that greatness, even with a single piece of clothing, furniture, or your ketubah! Retro, as a concept and a term, has been used since the 1960s. Retro has been used to describe melancholia and nostalgia people felt when it comes to the past, which they expressed through literature and art mostly. Today, we recognize retro motifs and ideas in many different areas. Retro, as a powerful wave in fashion, music, film, interior, and art, represents an accumulation of the best that styles had to offer over the years. Therefore, we could define retro as a carefully executed selection of supreme elements that stood out in various eras and periods, which have earned their place in the modern world. The popularity of retro is a proof that quality indeed does not have an expiration date, and certain styles will truly live forever. Whether it has been triggered by people’s dissatisfaction with the present or their melancholia, it is undeniable that the days gone by truly live through the retro style. The Retro Ketubah is a gorgeous, colorful ketubah design which will take you straight back to the 1970s. This colorful ketubah embodies the elements of modern art: bold shapes and outlines, geometrical motifs, as well as vivid, bold colors, while still nurturing the retro spirit of the disco, passionate, ever-green ’70s. We have been blessed with disco music back in the 1970s, and although those days are far behind, the retro movement in music keeps the disco sound alive. This unique retro ketubah design unifies different retro motifs while keeping the modern, edgy, extravagant touch our ketubahs are known for. Head over to our retro ketubah gallery to check out our retro designs!